The bandstand was built in 1912. According to an article by Terry Thompson, of the Trempealeau County Times, 6/14/2012, the cost to build it was $600. Already open-air concerts were being held, and the need for a permanent stand was desired, In July, 1912, a contract to build an octagonal stand of concrete (pebble-dashed) was awarded to John Spors and Arthur Gilbert. It was dedicated on October 3, 1912, in time for the county fair. ​In 2003, the downtown square along with the bandstand received $455,000 worth of improvements with the City funding half and the remaining coming from contributions both local and national. At that time, Brad Simonson planned the improvements. New cedar shingles were added and the exterior re-stuccoed and painted. Around the square, new locust trees were planted, The Bank of Galesville donated a clock, Brick pavers along with vintage lighting were also added. The entire project complemented the historic buildings that surround the square, many built in the late 1880s. 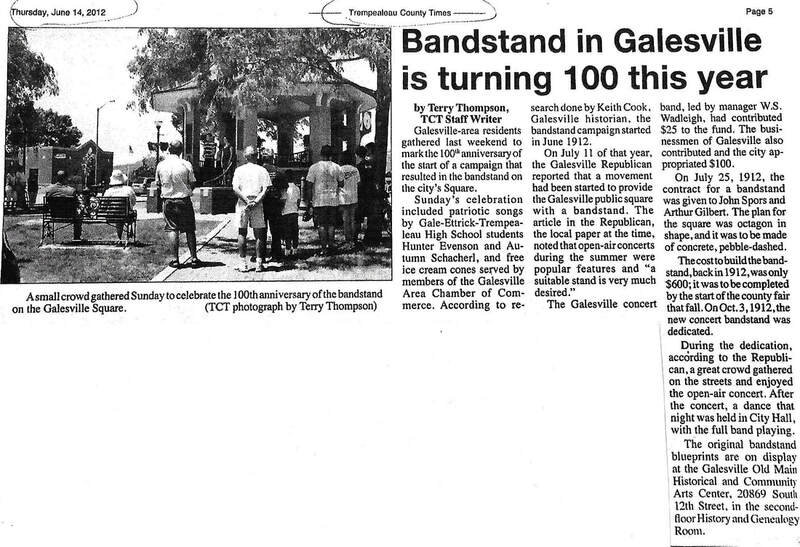 In 2008, the square in downtown Galesville, in which the Galesville bandstand is the focal point, was awarded the Scenic Beauty Award by the Citizens For a Scenic Wisconsin. 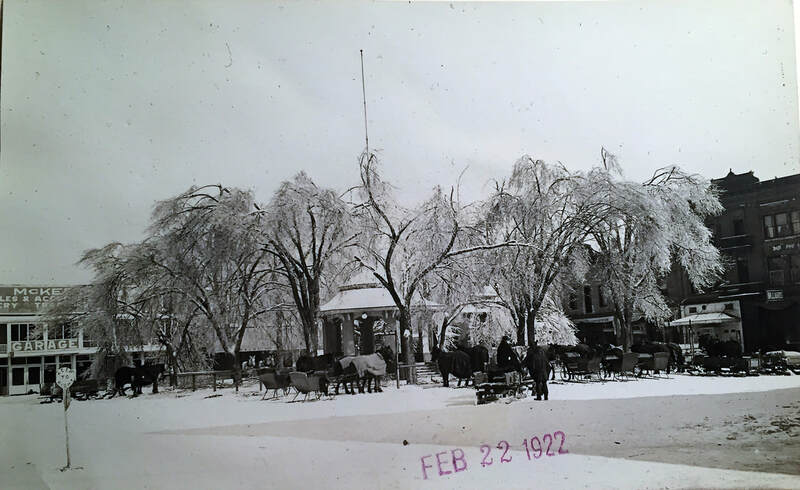 From February 21 to the 23, 1922, Wisconsin experienced one of it worst ice storms. 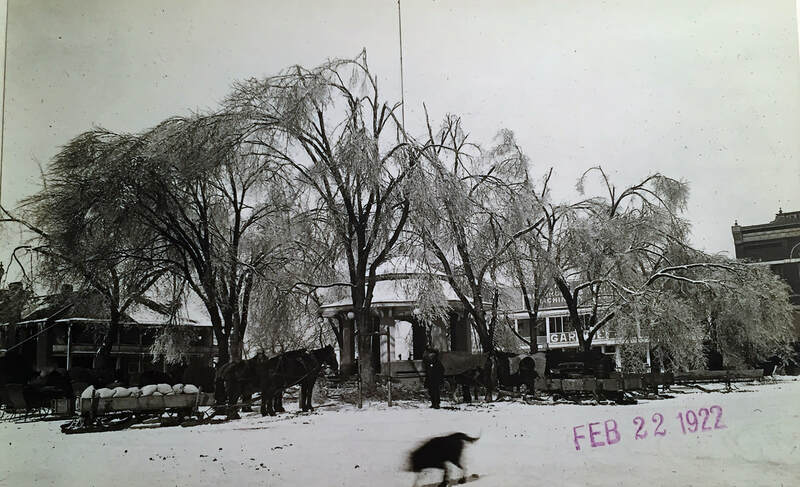 Reported by the National Weather Service, Galesville received about three inches of ice. Photo courtesy of Keith Cook, Galesville.